Turning the tide in fisheries policy? > In 2013, the European Union will agree a new Common Fisheries Policy (CFP), which will establish the regulatory framework for the management of fisheries in future. The European Commission has made numerous proposals for improving the disastrous fisheries policy pursued over recent decades. Discussions are still ongoing, but it is hoped that the ambitious goals can be translated into effective legislation. In future, fish stocks in the EU will no longer be fished in accordance with the precautionary approach; instead, stocks must be exploited at levels that produce the “maximum sustainable yield” (MSY) (i.e. the amount that can be harvested with a view to protecting stocks). Fleet overcapacity is to be reduced. The amount of unwanted bycatch is to be reduced and discards eliminated. Fishing should not only exploit fish stocks sustainably, but should also have minimum impact on marine habitats, the aim being to ensure that fisheries management follows the ecosystem approach. There should be a stronger focus on regionalization. Fishermen in the various countries and regions should be involved to a greater extent in fisheries management, with Brussels merely establishing the general policy framework. Many of these goals have already been achieved in other countries. In Europe, however, a sustainable and economically efficient fishing industry is still far from being a reality. It has become apparent that in a union of states like the EU, reconciling highly diverse national interests is a difficult process. However, the mere fact that the European countries were able to agree on a Common Fisheries Policy in the first place should be viewed as a success in itself. The Treaty of Rome, which created the European Economic Community (EEC) – the precursor to the EU – in 1957, contained a commitment to the formulation of a common fisheries policy. In those days, however, the fisheries sector was still relatively small and industrial fishing fairly rare. Furthermore, the scope of European fisheries policy extended only to the 12 nautical mile zone then in force. Much has changed since then. Firstly, as time went on, major fishing nations such as Denmark, the United Kingdom, Portugal and Spain joined the EEC. And secondly, the scope of application of European fisheries policy increased with the introduction of the exclusive economic zone (EEZ), which extends to a distance of 200 nautical miles out from the coastal baseline. As a result, individual Member States acquired exclusive rights to fish in much larger areas of the sea. A Common Fisheries Policy was first adopted in 1982, and was accompanied by the introduction of the quota system. Under this system, the EU sets a total allowable catch (TAC) for the various species of fish and then allocates a fishing quota (based on a percentage of the catch) to each fishing nation, calculated according to a specific formula. Whereas Denmark and Germany have already substantially reduced their fishing fleets, the Dutch, Portuguese and Spanish fleets in particular are still too large. 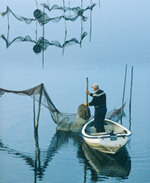 In regions such as Galicia, the fishing industry is still an important source of income, as very few jobs exist in other sectors. Politicians therefore shy away from any reduction in the fishing fleet, which is also heavily subsidized for structural policy reasons. In the structurally weak fishing regions, EU funding has been – and is still – accessed in order to put new fishing vessels into service or refurbish older ships. The welfare of the region as a whole thus takes precedence over the greater goal of sustainable fishing. But generous subsidies create a vicious circle for the fishing industry. Government loans for fleet development have to be repaid, which compels fishermen to fish intensively with no regard for the welfare of fish stocks. This is one of the reasons why the Fisheries Ministers, who form the Fisheries part of the EU’s Agriculture and Fisheries Council and are responsible for setting the new Total Allowable Catch (TAC) every year (in tonnes), have regularly set TACs which are far higher than recommended by fishery scientists – in extreme cases, up to 48 per cent higher. 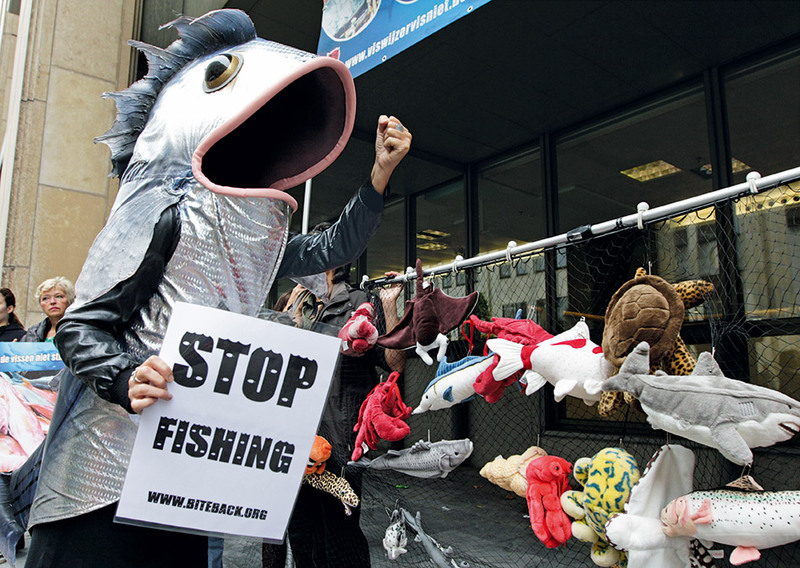 5.18 > Brussels: animal rights activists protest about overfishing. Tradable quotas Tradable quotas are a fisheries management tool used by various countries around the world. In 1986, New Zealand became the first country to incorporate a tradable quota system into nation-al legislation. These tradable quotas are often known as „individual transferable quotas (ITQs)“.The term preferred by the EU is „transferable fishing concession“ (TFC).